What follows is a selection of tips and points to bear in mind when repacking a reserve and reserve system. These aren’t instructions of how to repack – You have to follow the manufacturer’s packing instructions for that. Packing reserves is relatively easy but requires a methodical, vigilant and careful approach. You have to think logically at every step to ensure that nothing is done that could prevent a successful deployment that may save the pilot in an emergency situation. The terms reserve and rescue are interchangeable and both refer to the emergency parachute carried by pilots to be used in emergencies. I refer to this as a reserve but many people would call it a rescue. 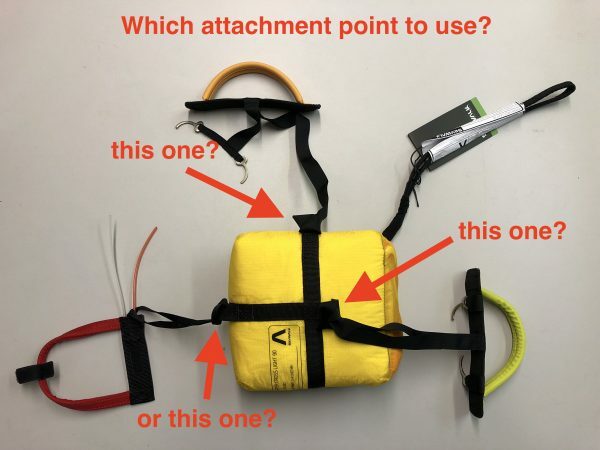 When we think and talk about reserves or rescues in general, often we are referring to everything that goes to make up a reserve or rescue system; ie, the reserve parachute itself plus the deployment bag and attached handle, the reserve bridle, connectors, harness, etc. The whole system has to be considered together, it has to be compatible and it has to be set up in a way that all parts work together without hindrance. Therefore there is a distinction between “reserve” and “reserve system” and both terms are used during discussion to mean slightly different things. When packing a reserve parachute and system, carefully follow the manufacturer’s packing method but common sense can often help as much as any packing instructions. Before you start – Repacking a reserve offers the perfect opportunity to test your existing system and the last re-pack. If possible, set up the harness so that you can deploy your reserve from your normal sitting position, otherwise put the harness on while standing on the ground. Deploy the reserve in the prescribed manner and note the forces required and if there are any issues. If it didn’t go smoothly then you need to investigate why not and sort any physical issues or make adjustments to the packing method to mitigate all issues. Packing issues and common problems will be discussed in a further article. Air your reserve overnight and make sure it’s dry and static free. Static can build up within the reserve material over time and will slow down deployment, another good reason to open your reserve and repack it regularly. Do you have the correct Packing instructions for your reserve? Check for safety notices, recalls and information regarding all components in the system. Known equipment issues continue to cause problems because packers fail to check safety notices. It’s always preferable to pack with another pilot, four eyes often spot more than two and four hands make packing easier. Sometimes six hands would be useful! A large clear and CLEAN space to lay out the reserve and lines without obstructions. About 1 meter of string/chord/line for collecting and holding the tabs often found one the seams at the top of the gores. two shorter lengths of non abrasive line for closing elastics, about 30-40cm long. 3 or 4 clean shot or sand bags, heavy books or similar will do. Packing board for making the figure of eight line bundles perfect. Spare rubber bands to replace ageing packing bands around lines. Knee pads if you’re packing on the floor. Some reserve packing tools on a nice clean packing floor. Large tables are also good. Make sure that any tools are large enough or made obvious enough that they won’t be left in a repacked reserve. 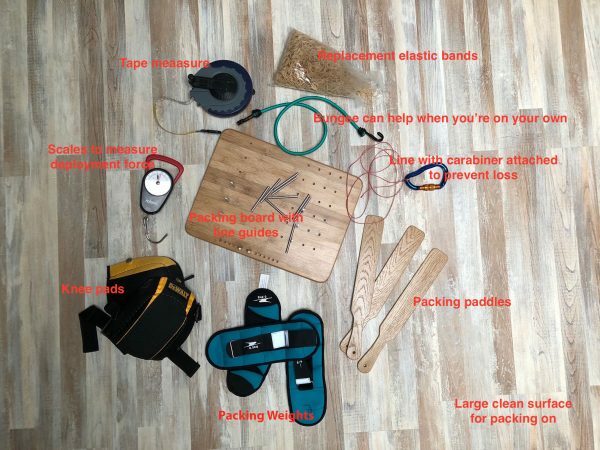 Check and count all tools before you repack and make sure you have the same number once you have finished, a schedule of items might ensure nothing is left in a reserve after packing that might impede or prevent deployment. Using the manufacturers recommended packing method and following their instructions, repack the reserve into the prescribed container/harness. Please note that this isn’t always easy as you may have a reserve parachute from Company X and a harness from Company Y, each requiring you to repack into their own fitted deployment container. This is where packing experience counts and common sense must rule as you can’t follow two opposing sets of instructions to the letter. Make sure that the deployment handle is connected to the deployment bag. You may snigger but not connecting the rescue handle is a surprisingly common fault! If there are more than one connection points, make sure that you use the appropriate one for the installation. Check – which is the correct attachment point to use? Make sure that the reserve is attached to the bridle and that the bridle is attached to the harness, ie that you re able to successfully deploy and throw the reserve and that the rescue system will suspend and carry the pilot once deployed. Make sure that any connectors used are aligned in their strongest configuration and that they are prevented by bands or covers from rotating. Hard connectors (carabiners, Maillons, etc) have a primary axis that is stronger that any other axis (more about this in another post). Make sure that the deployment bag is not connected to the reserve. Do not be tempted to attach the deployment bag to the reserve to help you find it afterwards. The deployment bag and handle are expendable items that are thrown away during a deployment. It should not be connected to the reserve in any way, it should just hold the reserve within it to enable deployment and once released, it falls away separately (It is often found close by after landing but it may be prudent to carry spares if you think you might be throwing you reserve, eg on an SIV). 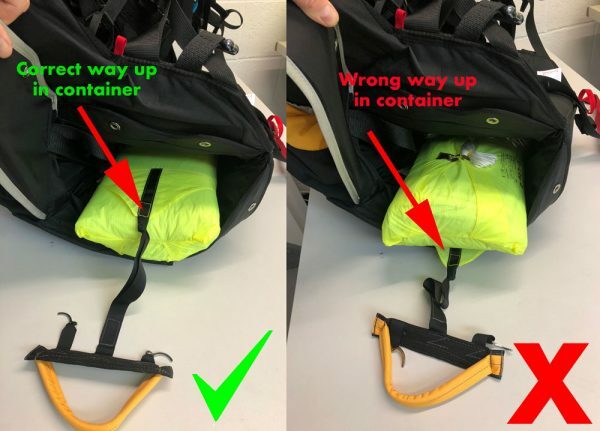 Make sure that the strap that connects the deployment handle to the deployment container is long enough for you to be able to extract the pins from the outer container or harness and release the reserve before it tightens on the deployment bag. Another common cause of failed deployments. Make sure you place the reserve into the outer container or harness the correct way up. An example of right/wrong is shown below. Right up / wrong way up? The image above is correct for the combination of harness reserve used here but may not be correct for other combinations – check the manual! Is the force required to deploy reasonable? Can the reserve be deployed easily and completely from the outer container? Are you sure that it will work? Yes? Then you can relax and sleep easy until next time.